One of the interesting features of the interim report is that staff numbers have not been significantly reduced. This is comforting and shows that profitability was not recovered on the back of substantial job cuts. The almost half-nationalised bank (with 24-17% UK retail & commercial banking market share, less than the 30% usually quoted) exceeded market expectations to report underlying pre-tax profit of £1.6bn for the first half of 2010. Like other banks positive results this follows sharp fall in loan loss provisions and higher mortgage lending revenue. 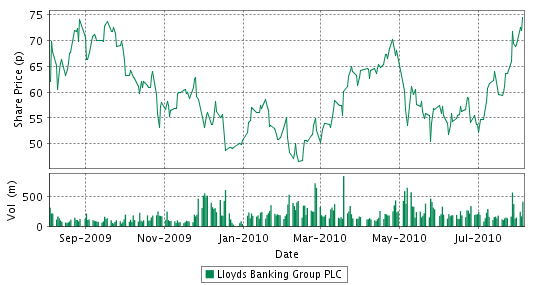 My own data below for end of 2009 shows UK banking market shares with LBG having the biggest share, if several percentage points less than the 30% reported to the European Commission when it insisted on the bank selling some of its banking network. The European Commission's competition DG is like national authorities keen that no market or major segment should have market players with more than 25% of the market. LBG could comply with that ceiling easily without selling off operating units and retail networks such as TSB in Scotland, Cheltenham & Gloucester, SW bank etc. There may be issues with regulators remaining concerning insurance and capital, but that too is resolvable. How integrated the bank's two major banking licenses (Lloyds and BoS + Halifax)should be in operating general ledger and core banking systems is an issue. My view is the bank should retain a group integration at a high level only. The bank needs new core systems, but combining and integrating all systems, not just at this time but at any time, is a potential systems management nightmare best avoided. Eric Daniels sponsored a top down risk appraisal of the HBoS books and his team should continue to refine the top-down rather than seek to replace it with the far more technically onerous bottom-up approach that I judge would encounter many problems to no additional benefit. The supervisory regulators need to understand the powerful benefits and practical good sense of top-down risk analysis, especially when Basel II systems including off-the-shelf leading black-box products remain buggy and need to move on to dramatically changed new generation products. The balance sheet has shrunk by 3%, which is modest in the circumstance and could arguably be comforting to government concerned about maintaining bank lending levels. The data excludes repo asset swaps lying with the Bank of England SLS, mainly (over £50bn) inherited from HBoS. These should have amortised substantially. Looking at the bank's funding it is also comforting to see little change despite the withdrawal of cross-border inter-bank lending and deposits. Funding gap financing has shrunk but only modestly. This suggests that the bank is not experiencing any financing problems, and that positive view should solidify now that the bank is back in profit, albeit it may be helped by the government share-holding. 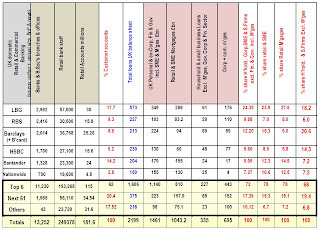 Little change in headline figures of a balance sheet after 6 and 12 months does not indicate no change. More than half of assets and liabilities should have been refreshed in that period and therefore the results show substantial stability in what has been a stress period for banks. 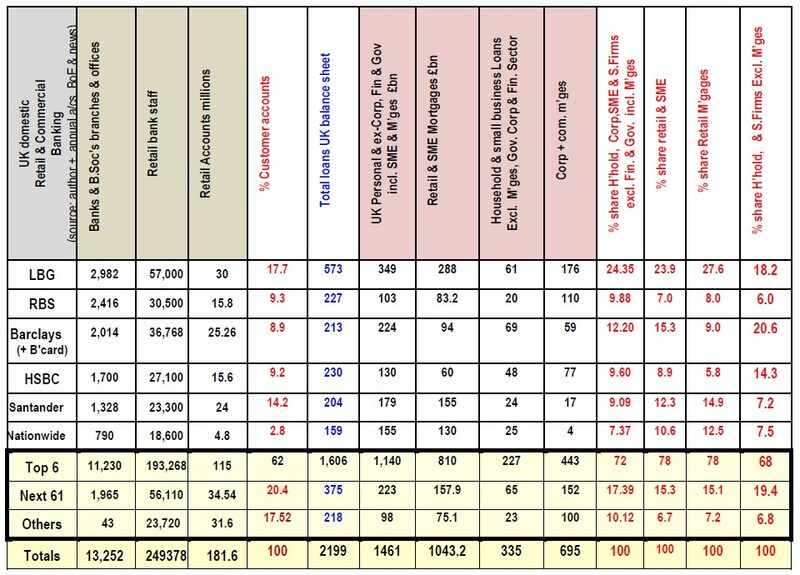 I judge from all the foregoing that LBG management, Daniels & his team, have taken a very mature and sensible approach - this is not eyewash - I genuinely believe from these figures that LBG management is doing a great job. Insofar as I have criticisms it is entirely in line with the government's concern too about lending to small firms. I am entirely convinced that major UK banks could be doing more and I do not buy UK banks assurances, including that of BBA and even daniels himself who together are holding to a banks' party-line that firms are deleveraging and banks must take extra care to lend prudently only to quality business models etc. I think this is foolish and a blinkered view of two imperatives, 1. to rebuild customer loyalty and to recognise the macro-economic needs of 'UK plc', and 2. to do more to reassure government at a time of considerable anxiety about recovery and dare I say hysteria about urgency in spending cuts. LBG's own chief economist's view is reasonably benign, but I think UK banks are not sufficiently cognizent of the important role they play in generating the recovery. The FT say that LBG results "are expected to bolster Eric Daniels’ position as chief executive after his position had appeared under threat earlier in the year following moves by chairman Sir Win Bischoff to sound out a replacement. But the bank was forced to defend how much it was supporting business through lending in the first half and the surge in profitability risks fuelling political concerns about the pricing power of the big UK banks. 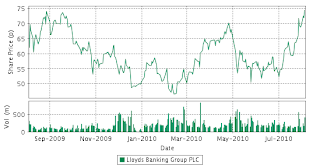 A big factor in the first-half rebound, the first profit since Lloyds made its controversial acquisition of HBOS, was a fall in losses on loans to £6.55bn from £13.4bn a year earlier. The bank also enjoyed higher profits on mortgage lending as it charged wider margins on new loans and funding costs fell. It exceeded its 2 per cent net interest margin target for the full year – a measure of the profit earned on mortgages. Mr Daniels tried to pre-empt possible attacks on the bank’s 25 per cent share of current accounts and mortgages, saying that the UK banking market was “fiercely competitive”". I don't agree. I don't believe any of the major UK banks, except maybe Banco Santander's UK operations, are being anything like 'fiercely competitive', not yet anyway. The emphasis is on balance sheet consolidation (restructuring and some shrinkage) and on cost-cutting, and then too on possible sale of operating units. I say 'possible sale' because selling banking networks that are not fully equipped banks with stand-alone systems (+ other issues) are not simple but fraught with matters to be resolved only over a number of years. This is shown most obviously by santander's purchase of RBS's William & Glynn network with only £100m premium or down-payment and the rest of the undisclosed price (maybe just north of £1.5bn) to emerge only over the medium term i.e. 3-5 years! LBG says it is on track to meet its government-set gross lending targets, having lent £15bn of new mortgages and £24bn of business loans in the first half of the year. We may trust the bank to do that except it continues to treat net lending to businesses as passive outcomes of gross lending (mainly loan recycling) and of customers paying down debt. When small firm lending is such a small part of the balance sheet, I wish the banks, LBG included, would at least see the sense and low risk of setting net lending targets that it knows it can fulfill - as a matter of strategic intent. Mr Daniels said loan applications fell 25% since 2007 and that £3bn of the £24bn of credit it had extended is lying unused, that there was “very little demand” for loans. I wonder if he is getting the true picture from below. It is clear from loan officers and surveys that many businesses are angry at being turned down and are struggling to obtain loans. The £1.6bn profit figure includes c.£300m one-off from integration of HBOS. The statutory pre-tax profit was £1.3bn, down from £5.95bn in the first half of 2009 – a figure the FT commented "was flattered by accounting gains on the HBOS assets". But, that is as it should be. Daniels was very clear over a year ago about working through the £80bn+ lower than acceptable risk quality of HBoS's corporate loan book, mainly SME and property sector lending.